As a 209-year-old company, Colgate-Palmolive is no stranger to successful multi-channel, big-budget ad campaigns. But in our rapidly changing world, Colgate realized that even time-tested strategies have room for improvement. When it was ready to launch a new breakthrough beauty product, Colgate Optic White Express White toothpaste, the team stopped to take a fresh look at the best ways to reach their target audience. Getting attention in the always-on, media-saturated digital world is harder than ever. And to reach a broader (and younger) audience, Colgate Optic White realized it would need to rethink just about everything. So Colgate, Red Fuse (Colgate’s integrated media and creative agency), and Google BrandLab came together to brainstorm and pave a digital way forward. The integrated nature of Red Fuse facilitated an environment where the media, creative, and Google teams could work together from the beginning. As Steve Forcione, CEO of Red Fuse, explained, "Our creatives, media people, and strategists actually sit next to each other. They work in conjunction around a specific brand challenge instead of taking an assembly line approach. And in this case, Google was invited to be part of the team from the onset. We all worked together to come up with ideas." Together at BrandLab, the group started by taking a hard look at target audiences: where they spend their time, the best ways to engage with them, and what human insights could drive compelling creative. On YouTube, enthusiasts watch beauty video tutorials, seek out the latest trends in fashion, and engage in real conversations with YouTube creators. So Red Fuse took the lead on building a rich creative campaign centered on YouTube. Colgate Optic White knew that for a campaign to be truly integrated, it needed a hub. And that creative and media hub was YouTube. To get the most out of the platform and earn legitimacy and relevance with the target audience—millennial beauty enthusiasts—Colgate teamed up with two rising YouTube influencers: Andrea Brooks and Blair Fowler. Collaborating with YouTube creators can require a shift in thinking for brands. Forcione explained, "When we work with these stars, we recognize that we have to let them bring the idea and the brand to life in their voice so that it resonates with their audience. That's a big change for brands that are used to controlling every detail of the content." So Colgate Optic White put its trust in Andrea and Blair, who created "The Smile Show," a series of videos featuring the product that have amassed 24M views and counting. Because the YouTube influencers know their audiences so well, they can produce content that is both relevant and useful to engaged consumers. Blair and Andrea's ease in front of the camera came through regardless of the medium. Campbell continued, "They had authentic excitement for the product. And that came across in the video, regardless of whether it was on TV, pre-roll, print, or on their own content channel." To ensure the creative had a broad millennial reach, the team put together an innovative, YouTube-led, integrated marketing plan. The campaign included traditional elements like print, in-store, and TV—and added more digital elements than ever before. The plan included the highest percentage spend on digital that Optic White had ever allotted. This increase represented both a leap of faith and a sound strategy (given where consumers are spending their time). Digital elements reached consumers on desktop and mobile devices, including the YouTube masthead, TrueView ads, Hangout on Air, GDN banners, and a YouTube channel gadget that housed "The Smile Show." Overlays were leveraged to drive viewers to watch additional episodes and to allow viewers to shop for the product right after they saw an ad or watched content. 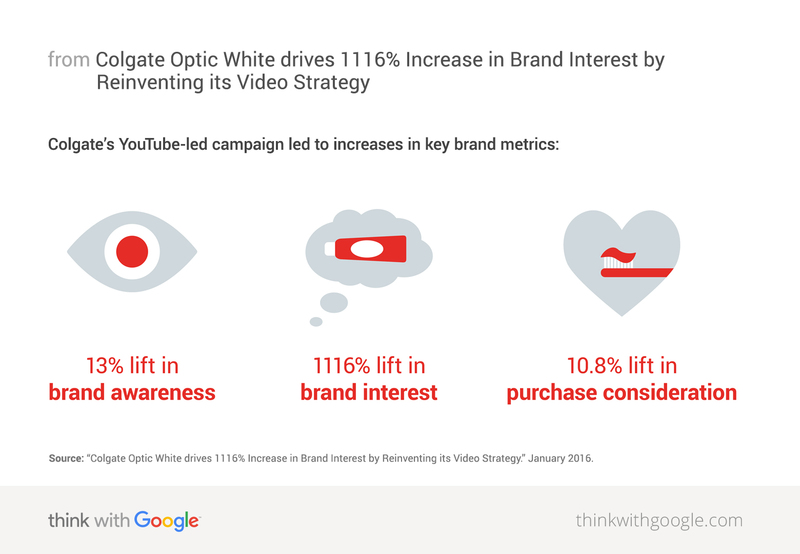 The team credits the YouTube-driven creative and media campaign to increases in every key brand metric. The numbers are staggering and far exceeded Colgate’s expectations. "The Smile Show" has generated 82 years of total watch time, with 24M total views. And the team credits the YouTube-driven creative and media campaign to increases in every key brand metric: a 13% lift in brand awareness, a 10.8% lift in purchase consideration, and an expectation-smashing 1116% lift in brand interest, which is 8X higher than U.S. CPG benchmarks. Not surprisingly, Campbell said this new approach is the way forward for Colgate. "We'll never look back. The BrandLab and Red Fuse approach and the content framework that YouTube has given us is a great, simple way to organize and promote our content. In the future we are going to be looking at content and YouTube media as an incredibly important part of all our big campaigns." With Red Fuse, Colgate Optic White is looking to continue moving dollars from traditional media to digital. And this campaign is driving change across the Colgate brand; its tactics and methods will be incorporated as new products are brought to market.